All eyes were on Pakistan's capital as its first A380 touched down at the airport on Sunday afternoon. The one-off flight by Emirates marked a special moment in the airline's history. Flight EK2524 touched down at Islamabad International Airport amid hopes that the airline will soon announce more A380 routes to Pakistan's major cities. 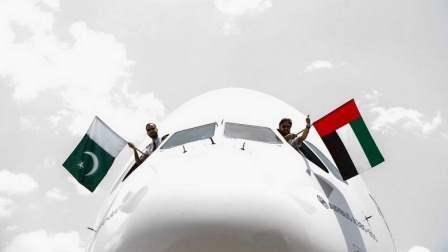 Sheikh Majid Al Mualla, Divisional Senior Vice-President of Commercial Operations - Centre, Emirates, says that the airline looks forward to launching its official A380 route as soon as the authorities in Pakistan give the airline the all clear. Flight EK2524 took off from Dubai at 8:20am and was welcomed in Islamabad with a traditional water cannon salute. Passengers onboard the flight hoped that the historic occasion will be followed with the launch of a dedicated A380 route, not just to Islamabad, but to several other cities in the country. "We are proud to bring our flagship A380 aircraft to Islamabad and we look forward to showcasing our innovative products on board this iconic aircraft with the signature Emirates service. While this is a special flight, we are very keen to launch a scheduled A380 service to Pakistan and will continue to work with authorities to realise these plans," said Sheikh Majid Al Mualla, divisional senior vice-president, commercial operations centre, Emirates. The Emirates A380 aircraft on this special one-off service will be in a two-class configuration offering seats in economy class and seats in business class as well as Emirates' onboard lounge. Passengers in all classes enjoy free Wi-Fi. Emirates and Pakistan have a shared history tracing back over 30 years when the airline's flight landed in Karachi on October 25, 1985. In the last three decades, Emirates has progressively expanded its operations and offering global connectivity to Pakistan's major cities including Karachi, Lahore, Islamabad, Peshawar, Sialkot, and Multan. Emirates currently has 104 A380s in service and 58 pending delivery, more than any airline globally. The airline also recently announced a $16 billion deal for 36 additional Airbus A380 aircraft.